You should never, ever judge a book by its cover. If you followed this, you would look at me and see a 5’2”, 100-pound, 16-year-old-looking person. You would totally judge me as someone who can eat 2 pieces of lettuce and be full. Never would you think that I write a Food Blog and can easily put down 2 Five Guys Burgers in one sitting. No, you would judge, make a face of jealously at this crazy bod and move along. So is the case when it comes to the outside façade of restaurants. Far too often do we see a restaurant, nestled in an older strip mall, and immediately turn our head. But, if you do this, and you happen to be in Naples, you will completely miss Martin Fierro’s Steakhouse. And this is a place you shouldn’t miss. Don’t Judge yo. 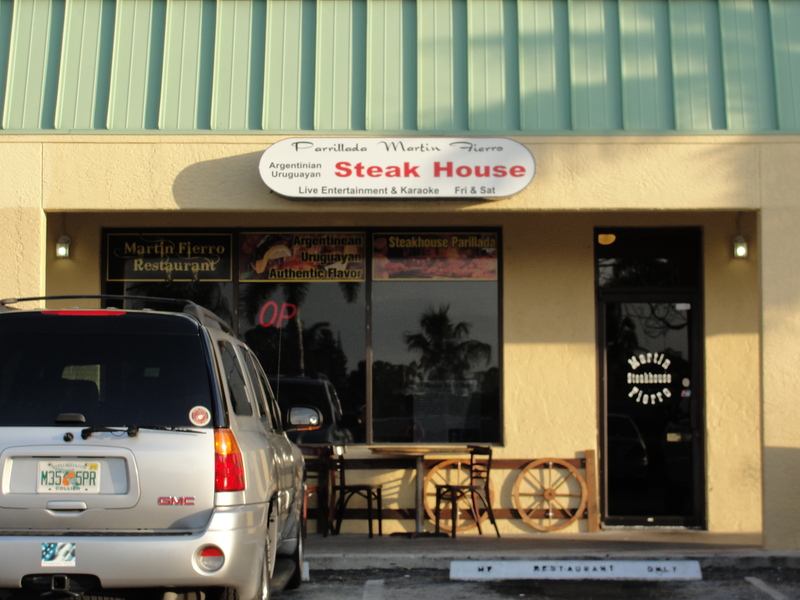 Martin Fierro’s Steakhouse is located in a small, older strip mall about 30ish minutes from my house in Naples. We had heard of it before and added it to our list of restaurants to try. Well, a few weeks back, we finally did. Mommy, Gino and I ventured out on a Saturday night and arrived to a nearly empty restaurant. The outside looks like just any other strip mall but, once you cross the threshold and enter the restaurant, you are greeted with a warm & wooden feel. There are maybe 20 tables – all wooden, and the entire restaurant has a very warm, homey feel to it. As soon as we sat down, a plate of chimichuri and warm bread pieces were brought over. The chimichuri had an insane amount of garlic in it. As soon as it was placed down, I could smell the garlic seeping from it. I had a piece of bread on its own and found it to be great. The flavor was of a simple dough and the bread itself was warm. I did try some of the chimichuri with the bread but, found the chimichuri to be simply far to garlicy for my taste. 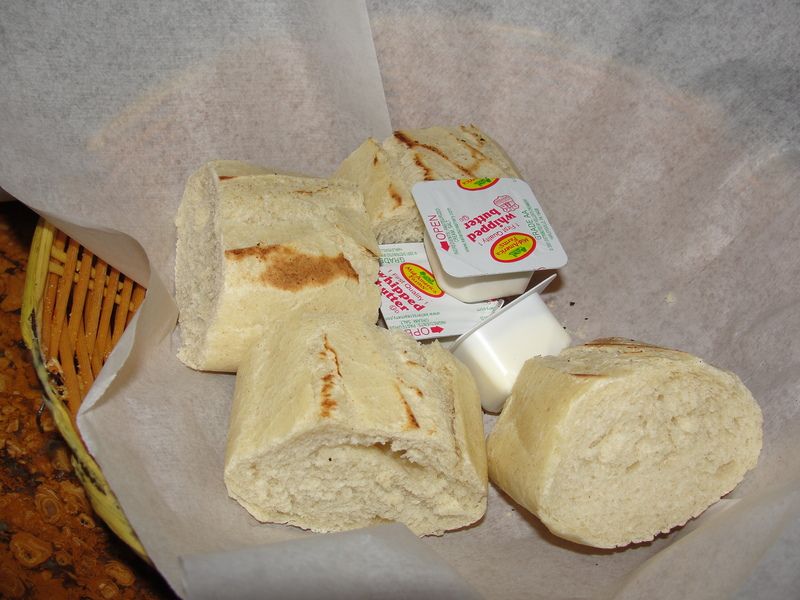 However, the bread on its own was great and I had no problem downing it. For appetizers we decided to try the fried cheese and two empanadas – one chicken and one beef. The fried cheese was served in a cast iron plate. It consisted of provolone cheese, tomatoes and some seasoning. We each took a piece and it was amazing. The cheese was perfectly melty and completely flavorful. 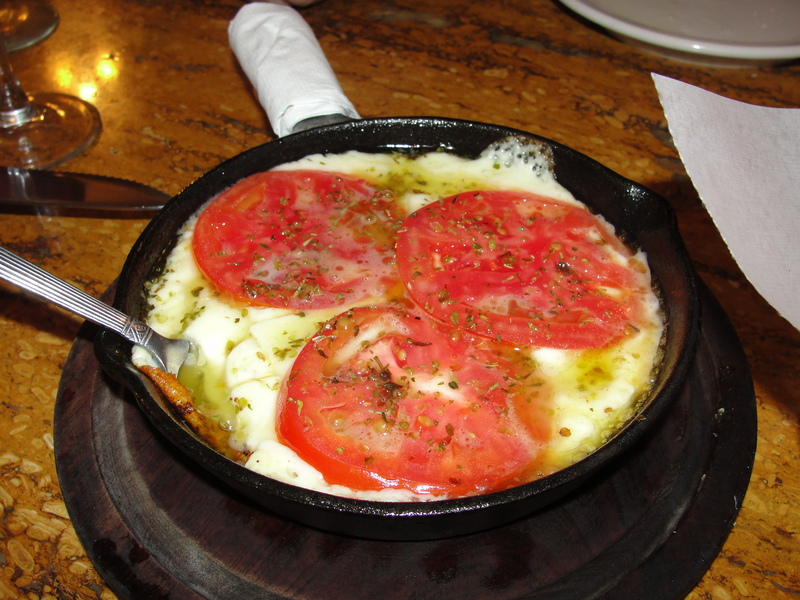 The provolone did not have any over bearing funky cheese taste and paired nicely with the tomatoes and seasoning. As for the empanadas, we split each one into 3 pieces and had a piece of each. The chicken empanadas was not very good. The interior was dry and completely flavorless. But, the ground beef empanadas was great. The interior was juicy, flavorful and simply melted in my mouth. 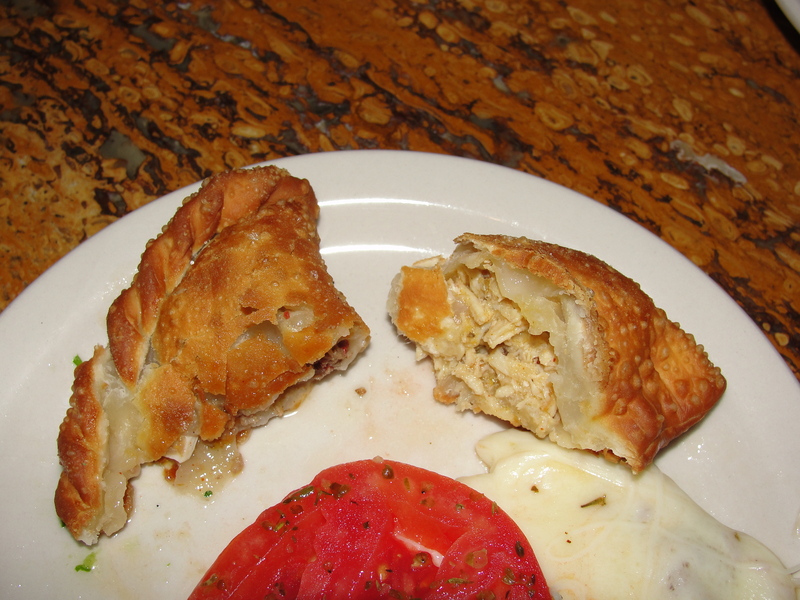 As for the exterior of both empanadas, they were equally good. The dough was fried to just the point of bring crispy. Even though we were at a Steakhouse, I did not want steak as my main course. Why you ask? Because I do not like steak. Duh. For my main course, I went with the Lobster Ravioli in Tomato Sauce. I was presented with an overflowing plate-bowl with an abundance of tomato sauce. There was beyond too much sauce and I left at least half of it in the bowl. 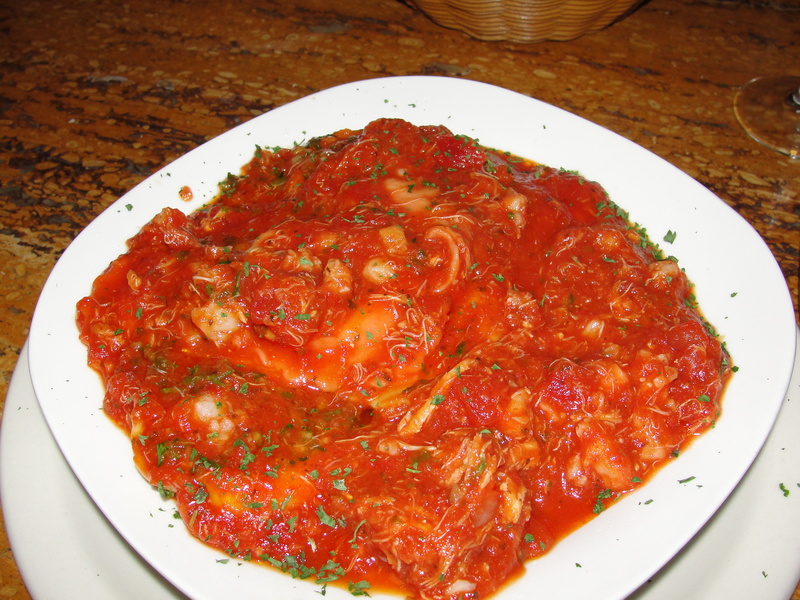 The tomato sauce was very fresh and was bursting with the flavor of tomatoes, wine, rosemary and oregano. This was some great sauce. Except, like I said, there was wayyy too much of it. Rather then have ravioli stuffed with lobster and cheese ,the ravioli in the Lobster Ravioli, were just plan cheese ravioli. The pieces of lobster were mixed within the sauce. The pieces of lobster were very small, very unflavored and very sporadic in my bowl. This could have been a really good dish if the ravioli themselves contained the lobster. But, since they didn’t, the dish was just good. Every ravioli was stuffed full of a mixture of ricotta, parmesan and romano cheeses. 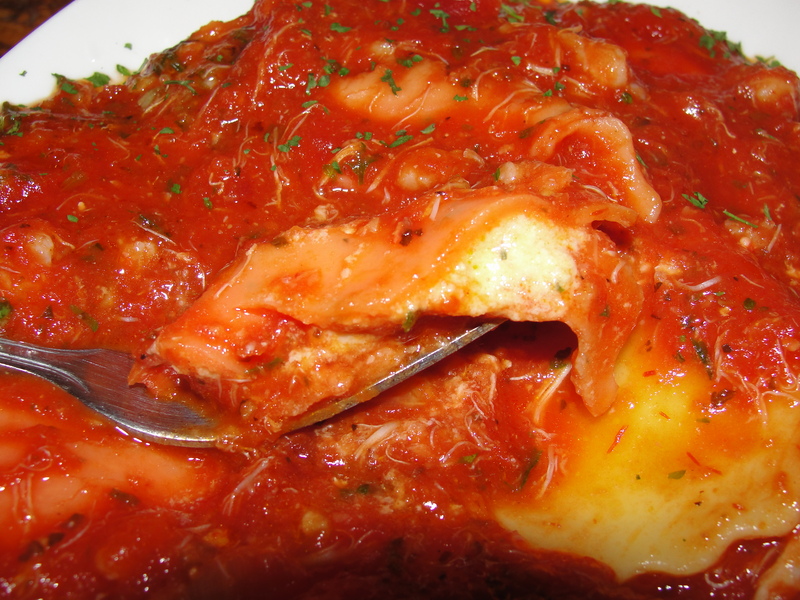 While the outside of the ravioli was soft, the interior was even softer. I enjoyed how the gooey cheese mixed with the pasta. I don’t think these ravioli were homemade. Even with these imperfections in the meal, the overall entrée was good. After we finished our meals (both Mommy and Gino had steak dishes – both enjoyed), we opted for the Crepes off recommendation of one of my friends. Our server told us they would be just a bit as she had to prepare them fresh. After waiting 15 or so minutes, we were presented with 2 crepe filled with caramel, topped with chocolate sauce and a small scoop of vanilla ice cream. I found the crepes to be way too thick and closer to pancake consistency. 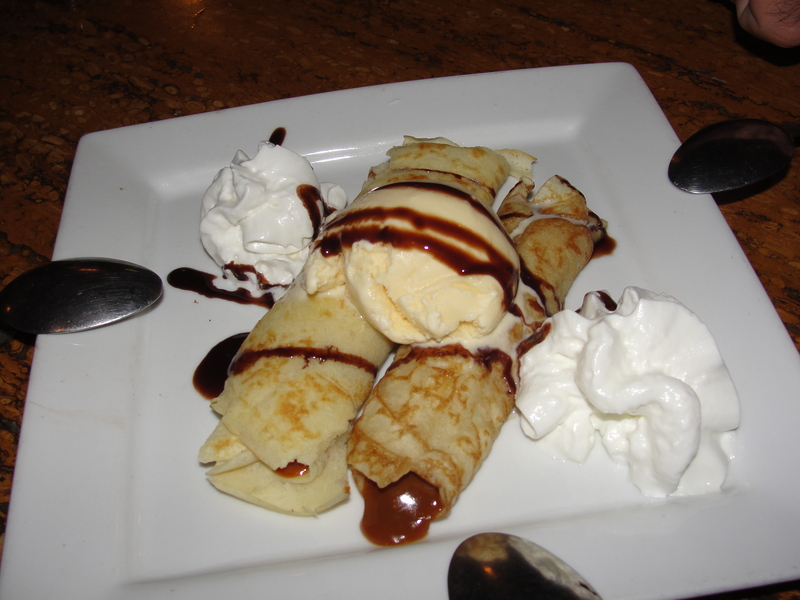 The flavor of the crepe was also a bit too pancake-esq for me. The caramel filling was very dense and rich – and quite yummy. While I am not a fan of chocolate sauce (of course, I prefer hot fudge), this sauce had a good flavor to it and I liked the way it mixed with the caramel. As for the small scoop of vanilla ice cream, it really did not add a thing to this dessert. It was out of a carton and just kind of there. We had a nice visit at Martin’s and some fabulous service. Also, on Saturday nights there is live entertainment. While I did not think my meal was the best meal ever, it was indeed a good quality meal. The next time I return, I think I will try another entrée. There were a few others on the menu that tempted my fancy. Plus, Martin offers a varieties of specials. While Martin’s may be located in just some ol’ strip mall, the feeling of home is all around when you walk in. The combination of great service, good sized portions and tasty food, make Martin’s a place I will surely visit again. Just like looking at Grandma can lead you to believe incorrect things, so is the case with Martin. Don’t Judge Yo, Don’t Judge.